Businesses often need to complete projects. A project can be defined as the pursuit of a final objective which requires a number of tasks to be completed. In our personal lives we all complete projects, for example decorating a house, organising a birthday party or booking a holiday. In each of these examples there are a number of tasks that need to be completed. Often projects need to be completed by a set date and there is no leeway for example the tasks for the birthday party will need to be completed by the day of the birthday. Other projects may incur penalties if they are not completed on time for example the costs of flights will increase as you get closer to the date of the flight. The majority of projects have a budget for completing the project tasks. Using the decorating a house example, there are many ways to decorate a house; some options will be more expensive than others. Your final choice of décor will depend on how much money you have to buy paint, wallpaper, tools etc. To minimise the impact of a risk if its occurrence can't be prevented. As the list of project risks could be quite long the project team may decide that it is impractical to try and manage all of the risks; instead they may focus their attention on the risks that are most likely to occur and the ones that will have the greatest impact on the project. 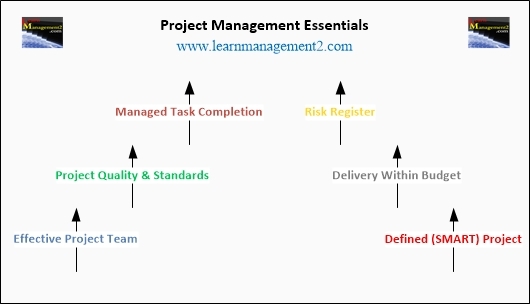 Bearing each of these requirements in mind let’s define project management. Project management is about ensuring that the tasks of a project are completed on time and within budget. The standard to which the tasks are completed is very important, otherwise the project may cause more problems than benefits. For example a badly decorated house will need to be redecorated and a holiday that people do not enjoy will cause people stress and not relaxation. “about ensuring that the tasks of a project are completed on time, within budget and to the highest possible standard”. There are a number of ways to manage a project but each method should state who is responsible for each task and set a deadline for the completion of the task. The project manager should regularly review how each task is progressing and take action if it is not on track for completion by the deadline.